Add a precious metal twist to your jewellery collection with this understated and elegant bracelet, crafted from precious 9ct Yellow Gold and embellished with a layer of textured metal for a wonderfully striking contrast. Clasp style may vary. 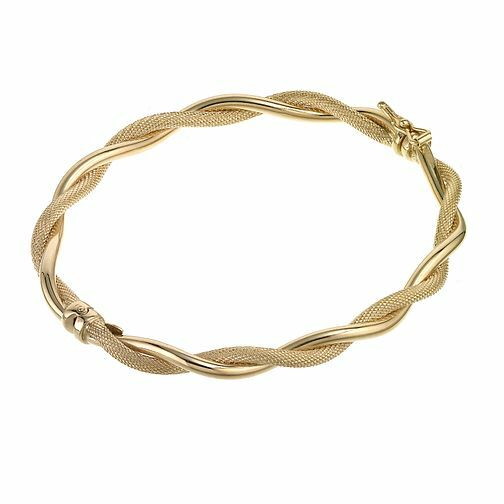 9ct gold matt and polished twist bracelet is rated 3.2 out of 5 by 5. Rated 1 out of 5 by Anonymous from Clasp Fastner Broken My husband bought this for me as a present but within a couple of months the fastner broke and I can no longer wear it. Apparently it can't be repaired!